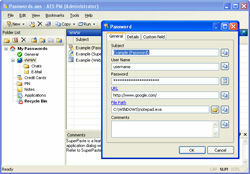 AES Password Manager is a password management solution ideal for both home and office use. Besides passwords, it can securely store any other sensitive data including credit card numbers, PIN-codes etc. Then, AES Password Manager can automatically enter this data into web-based and other input forms as needed saving you from this tedious work. AES Password Manager fully supports multi-user operation. This means you can have several users, each with his own password; these users can be assigned different rights (i.e. rights to view or modify specific items) and these users can access the database (e.g. stored on a network share) simultaneously. However, if you intend to use AES Password Manager is a single-user environment, these features can be turned off for convenience. As the title implies, AES Password Manager uses the AES encryption algorithm to encrypt data stored in the database. Moreover, it uses the strongest variation of this algorithm, namely AES-256, which has been adopted by the U.S. Department of Defense. Here are some of the most useful features AES Password Manager offers: The Install to Removable Device Wizard will help you install both AES Password Manager and the database onto removable media (such as a USB flash drive), so that you will be able to access your private data anywhere. The Internet Explorer toolbar will help you save information you enter into web forms so that these forms can be automatically filled in afterwards. The SuperPaste feature provides you with the ability to automatically fill any input form in any application by simulating keyboard presses. The engine supports input forms of unlimited complexity. To make sure you can easily take advantage of all of the features, AES Password Manager provides you with flexible user interface that can be easily tuned to suit your needs.